There are so many interesting and innovative features when it comes to recliners, and one of these features is the laptop table or tray, which is foldable so that you can relax when you need it out of the way. In this article, we will be looking at recliners with this specific feature, and all of its resourceful and current uses. The Zero Gravity chair is one of the healthiest reclining chairs you will find, it to has an attached tray or table that enables you to use your laptop in any recline position. You can purchase the Zero Gravity chair with the attached table or purchase the table separately. Now you can lay back in any position, knowing that your body is fully and ideally supported while playing a fun game on your report or tablet, watching a movie, or catching up on some work. Many powered or manual recliners feature a foldable tray, in some cases meant to store snacks on, but just as versatile to use as a laptop or tablet stand for you to enjoy, in a comfortable recline position of your choice. A laptop table or tray can be purchased in many forms as an additional extra for your recliner, some offer a universal fit, others are made to fit specific recliner brands and models. I absolutely love this idea for kids, even teenagers, sitting comfortably on their recliner laptop or tablet on the table, doing homework, studying or just enjoying a fun game. Use your laptop table or tray to place snacks, remote control or other useful gadgets on. Most Recliners come with a USB port and a tray or laptop table so you can charge while using your laptop. Most of these tables and trays are very easy to fold and put away beside the recliner or in the arm storage when not in use. A create space for kids to draw and color on. A platform for playing a board game. A platform for doing makeup while watching a show you cannot miss. Honestly, besides for your Laptop, the sues of a laptop table or tray on your recliner is about as much and widespread as your imagination goes! Vibrate, massage, swivel, rotate, or rock. Provide other features such as a USB port, cup holder and storage space. The Seatcraft Monterey is just luxury in a chair, with so many exceptional features at the touch of a button, this is the ideal recliner for any home and any purpose! This one gets the highest score from me because there is just nothing that it does not have! Upholstered in top grain fine hand-selected leather that is elegant and durable. An adjustable powered headrest, recline function, and footrest. Complete home theater system with the USB charging port, cup holders, foldable hidden tray table, in arm storage, lighting in the cup holders and ambient base lighting, along with accessory grommets. A power control panel allows you to adjust and operate all the functions of your recliner. Cool gel foam in the filling contours to the shape of your body and regulates temperatures. The Barcalounger is a plush and comfortable recliner that comes fully equipped with a foldable table, USB charging port, in arm storage and lighted cup holders. Upholstered with a leather Gel that gives the feel and elegance of pure top grain leather but is more soft and durable. Power reclining features with the touch of a button. Adjustable footrest and ambient base lighting. A nifty lighted cup holder, USB charging dock and a foldable tray table for laptop use and many other uses. 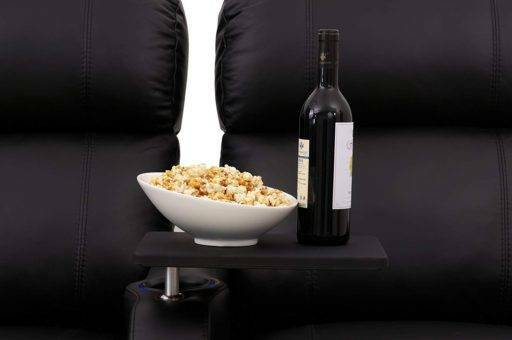 The ideal theatre seat, or functional work seat, for catching up at home. So you already have the recliner but are in desperate need of a proper laptop table or tray. I highly recommend this little number, it is ideal for using your Laptop on in any position on your sofa or recliner, and comes with a cooling fan and mouse pad. A lightweight and sturdy laptop stand that is fully adjustable to use on your recliner, sofa, bed or side table. Helps to protect your neck and shoulders from strain by offering you an ergonomic placement spot for your laptop anywhere and in any position you require. Features a mouse pad and effective cooling CPU Fan. I have taken into consideration, individuals who may suffer from a medical condition or injury, preventing them from going to work, or placing them in a chair bound position. The Drive Medical Chair is a reclining chair with medical aiding features as well as a functional table that you can place a laptop or tablet on for entertainment, or to perform work functions. Full recline positions with a footrest and five casters for easy movement and mobility. The armrests are wide and comfortable with angles to support you in any reclined position. A neutral colored and sturdy steel frame, easy to clean and strong enough to last. The seat is covered with soft and durable leather that has a moisture barrier on the seat to prevent seepage. The large blow-molded tray can lock into five different positions and is easily stored on the side of the chair. The large tray is ideal for placing your laptop on and even has a handy cup holder. When it comes to comfort and supportive, ergonomic health chairs, there is just nothing that comes close to the Perfect Chair from Human Touch. An ergonomically designed Zero Gravity is reclining chair with an additional Laptop table. A Zero Gravity recliner that cradles your back and elevates your legs above your heart for the healthiest seating position. Easy ingress and egress with the extended motion range that can place you in an upright position, if your struggle with mobility. An Orthonomic body frame with built-in lumbar support and a very reliable and easy to use braking system for a fast stop. The headrest is fully adjustable and offers you the maximum neck and shoulder support. Longer armrests for better arm support. An exclusive guide rail system that allows for smoother recline motion and better position control. Comes fully equipped with patented Human Touch Laptop desk table. When it comes to recliners with built-in trays or Laptop tables, the options are few, although you can get some excellent choices in separate trays or desks to attach to or use with your recliner. A recliner with an additional foldable tray or laptop table is an excellent convenience and offers you an area where you can place your laptop or tablet for entertainment or work purposes, among many other uses. Children can greatly benefit with this feature as an educational and a recreational device where they can play games or learn on the tray or table. Adults or individuals who are sick or immobile will likewise benefit by being able to entertain themselves or perform work tasks on their laptop while relaxing and healing and a comfortable recliner. Furthermore, just for any individual who wants to relax and play a few games on their laptop, or finish a few work tasks in the comfort of their own home. These are just a few common scenarios where a laptop table or tray on your recliner can benefit you.